We pose a question about biodiversity to people representing a range of careers. One person who receives the question brainstorms to reply to it and passes the same question on to another. The question is answered through a relay of people. 11/11/2013　What initially got you interested in biodiversity? (4) What initially got you interested in biodiversity? 30/09/2013　What initially got you interested in biodiversity? (3) What initially got you interested in biodiversity? 09/09/2013　What initially got you interested in biodiversity? (2) What initially got you interested in biodiversity? 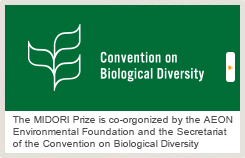 29/08/2013　What initially got you interested in biodiversity? (1) What initially got you interested in biodiversity? 01/07/2013　Green Wave Initiative: (6) What impressed you the most in the countries where you visited for the Green Wave Initiative? 17/05/2013　Green Wave Initiative: (5) What impressed you the most in the countries where you visited for the Green Wave Initiative? 30/04/2013　Green Wave Initiative: (4) What impressed you the most in the countries where you visited for the Green Wave Initiative? 16/10/2012　Green Wave Initiative: (3) What impressed you the most in the countries where you visited for the Green Wave Initiative? 31/08/2012　Green Wave Initiative: (2) What impressed you the most in the countries where you visited for the Green Wave Initiative? 21/06/2012　Green Wave Initiative: (1) What impressed you the most in the countries where you visited for the Green Wave Initiative? What initially got you interested in biodiversity?